(announced Jan. 30, 2007) President of MVP Leadership, Inc., a Sioux City consulting business that specializes in strategic vision and executive leadership; Vander Plaats founded the firm in 2003. Republican nominee for lieutenant governor in 2006; earlier was a candidate for governor (announced in late 2004 but withdrew in Feb. 2006 and endorsed Jim Nussle). Narrowly lost to Doug Gross in the 2002 Republican gubernatorial primary. President and CEO of Opportunities Unlimited, a health and human services organization, starting in 1996. Principal of Sheldon High School. Principal of Marcus-Meriden-Cleghorn High School. Taught business and was head basketball coach in Jefferson. Taught business courses at Boone High School. Undergraduate degree from Northwestern College in Orange City; Master's and specialist's degrees from Drake University. Sheldon native. (announced Jan. 30, 2007) Represented District 75 (Grinnell) in the Iowa House; first elected in 1994, recently served as the Speaker Pro Tempore, defeated in 2006. Maintains Carroll's Pumpkin Farm near Grinnell and is director of Community Relations at Iowa Telecom. Has also worked in real estate sales and property management as a real estate broker. Elected to the Poweshiek County Board of Supervisors in 1984 and served on that board until his election to the Iowa House. (first reported as Coordinator of Hope for America PAC on June 13, 2006; June 14 press release) President and CEO of The Concept Works, a public, media and government relations and crisis management firm with offices in West Des Moines and Bettendorf that he founded in 2002. Communications director on then Gov. George W. Bush's Iowa caucus campaign, 1999-2000. Communications director for Gov. Terry Branstad during his final term. Previously worked for 20 years as a member of the Iowa press corps. O.Kay Henderson notes on Radio Iowa, the blog (June 13, 2006) that, "Woolson left the Waterloo Courier in 1987 to work as press secretary for Delaware Senator Joe Biden’s Iowa effort." He is also author of Grassley: Senator from Iowa (Mid-Prairie Books, Nov. 1995). 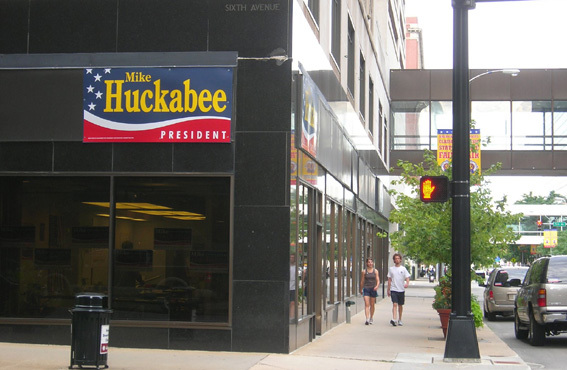 (announced April 11, 2007) Prior to joining the Huckabee campaign Enos worked for Nationwide Insurance. Republican nominee for Polk County's 3rd Supervisor District, 2006. Central Iowa deputy director on Vander Plaats for Governor, 2006 (mostly 2005). Statewide operations director on Mike Hartwig for Secretary of State, 2002. Active in Polk County Republican politics for more than a decade; worked with various legislative candidates in the 1994, 1996, 1998 and 2000 election cycles. B.A. from Grand View College in Des Moines. Des Moines native. (from July 1, 2007) Iowa field director on Sen. Sam Brownback's campaign through about June 2007; Brownback's first Iowa staffer starting in Dec. 2006. In Fall 2006 Walsh was a regional political director for Iowa Republicans' Legislative Majority Fund, overseeing 13 State House campaigns in eastern Iowa. In Fall 2005 he managed Robert Wittman's campaign for Virginia House of Delegates (99th District). Worked on state Rep. Bev Kilmer's 2004 congressional campaign in Florida. Worked on Rep. Jim Leach's 2002 re-election campaign. Graduate of the University of Iowa. (announced Nov. 13, 2007) On leave from the Iowa Family Policy Center, is the part-time associate pastor at First Christian Church in Cedar Falls, and is working toward a master’s degree in transformational leadership at Bethel Seminary in St. Paul. Reisetter sought election to the Iowa House in 2006. He worked as a college ministry director for seven years at Nazareth Church in Cedar Falls. Graduated from the University of Northern Iowa in 1998. Born and raised in Cedar Falls. Chuck Hurley - (announced Dec. 4, 2007) An original member of the Iowans for Brownback Leadership Committee President of the Iowa Family Policy Center. Former state representative (represented Fayette County and surrounding from 1991-96). Classmate of Brownback's at University of Kansas law school and at Kansas State Univ. where both studied agriculture. Luana Stoltenberg - (announced Dec. 4, 2007) Davenport pro-life activist. Stoltenberg has been involved with Crisis Pregnancy Center in the Quad Cities, has been a board member and spokesperson for the Life and Family Coalition, and is is active in Operation Outcry: Silent No More. She is a former supporter of Sen. Sam Brownback’s presidential effort. Rev. Brad Sherman - (announced May 11, 2007) Pastor and founder (1981) of the Solid Rock Christian Church in Coralville. Board member of the Iowa Christian Alliance. Author of several books. He also is the founder of Purpose Ministries, which focuses on current world view issues of purpose. In addition, Sherman serves as a board member of Miracle Life Ministries. He and his wife have been married for more than 30 years and have four children. Scott Spray - (announced May 11, 2007) Board member of the Iowa Christian Alliance since 2002. He was awarded Christian Coalition of Iowa “Friend of the Family” award in 2001. A graduate of the University of Northern Iowa, Spray is the general sales manager for CompUSA in Clive. A veteran of grassroots political efforts in Iowa, he is a past member of the Black Hawk County GOP Central Committee and a current member of the Polk County GOP Central Committee Scott and his wife, Debbie, have three daughters. Bob Parker’s ancestors came to Iowa as pioneer farmers before the Civil War. He has been a manufacturing manager, merchant, instructor in the Iowa State University College of Business and a small business consultant for 20 years. He was assistant director of the Iowa Small Business Development Center for 12 years. Bob is also a former chair of the Story City Chamber of Commerce and was the founding president of the Story City Kiwanis Club and a Kiwanis lieutenant governor. Loretta Parker has operated the family retail business and served in a marketing role for two local businesses. She and Bob served as co-chairs of the Scandinavian Days celebration. She was chair of the Story City United Fund drive and has been active in several other community fund-raising projects. The Parkers have lived in Story City for 34 years. They are active members of Grace United Methodist Church.